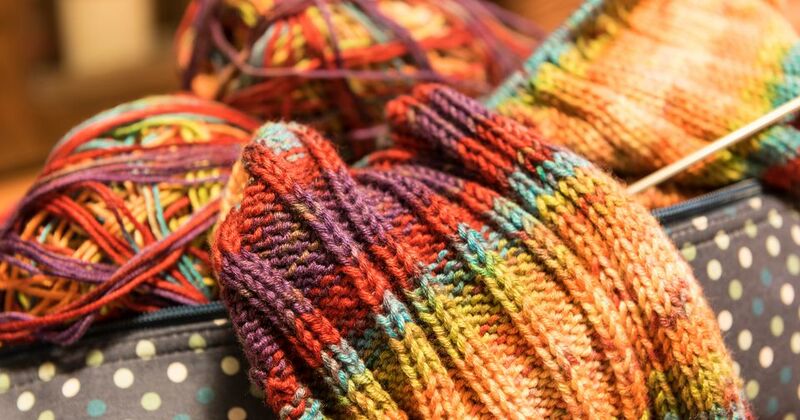 Knitters and crocheters always have a project going and it's helpful to keep those projects in an easy-to-tote bag. This simple project bag keeps your work clean and safe while allowing you to take your latest project with you on the go. The snaps at the top close the tote enough to keep items inside, but they also make it possible to pull the yarn out as you work. You can even slip your hand through the strap and let the bag hang from your wrist as you knit or crochet! Cut the fusible interfacing into pieces slightly larger than the measurements below, then iron the pieces to the back of the fabrics. Cut two 12-1/2" x 7-1/2" rectangles. Cut two 12-1/2" x 6-1/2" rectangles. Cut a 2-1/2" square from the two bottom corners of each piece. Cut two 12-1/2" x 13" rectangles. Cut one 12-1/2" x 2-1/2" rectangle. With right sides together, sew the strap piece in half lengthwise with a ​1/4-inch seam allowance. Turn the tube right side out and press it flat with the seam at one edge. Top stitch the two sides 1/8" from the edge. Set the strap aside. Pin and sew the two lining pieces with right sides together. Sew the two long sides and the bottom edge. Leave the indented corners unsewn for now. To form the boxed bottom, match a side seam to the bottom seam so the open edges line up. The unsewn edges should be straight and perpendicular to the opened seams. Pin and sew the boxed bottom with 1/4-inch seam allowances. Join the top and bottom outside pieces together with right sides together and press the seam open. Repeat with the other top and bottom pieces. Fold the strap in half and place it on the side of an outside piece 1-1/2" from the top. Position it so the ends of the strap are next to each other and aligned at the edge of the fabric. Place the second outside piece on top with right sides together, matching the seams. Sew the two sides and the bottom. For extra security, you may want to backstitch across the straps. Press the seams open. Sew the boxed bottom as you did the lining. Turn the lining right side out and place it inside the outer part of the bag so the right sides face each other. Pin around the top of the bag. Sew the lining and outer bag together around the top, leaving a 4-inch opening. Backstitch at the beginning and end to secure the stitching. Turn the bag right side out and iron it well, opening the top seam. Press the open seam allowance in so it aligns with the rest of the seam. Topstitch around the top of the bag, sewing 1/8" from the edge. This gives it a nice finish and closes the opening. Attach the snaps about 3/4" from the top and 4" in from each side. Follow the manufacturer's instructions for installing the snaps. You can store a working project in the bag to keep it safe and clean or carry your project with you on the go. Because this bag doesn't have a zipper, you can leave your ball of yarn inside the bag and pull from it as you work without the worry of snagging your yarn! 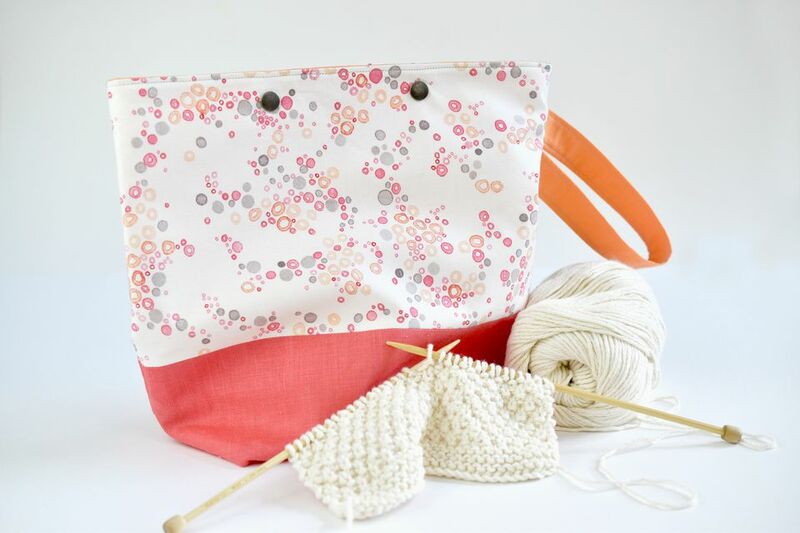 This project bag is big enough to hold two small projects, but you might want to go ahead and make an extra bag or two so you can store more than one knitting or ​crochet project at a time!